Soak the dried green lentils for around 5 hours in cold water. Discard the water and replace with fresh water. Boil for around 45 – 60 minutes until soft. Heat 2 tbsp sunflower oil in a large pan, add the leek and fry for around 5 minutes, add a little water, turn the heat down and cook for around 15 minutes. In a separate pan, heat the rest of the oil and fry the onions for 5 minutes, add the garlic and fry for another 2 minutes. Add this mixture and the leeks to the cooked lentils. In the, now empty, onion pan, fry the bacon rashers. 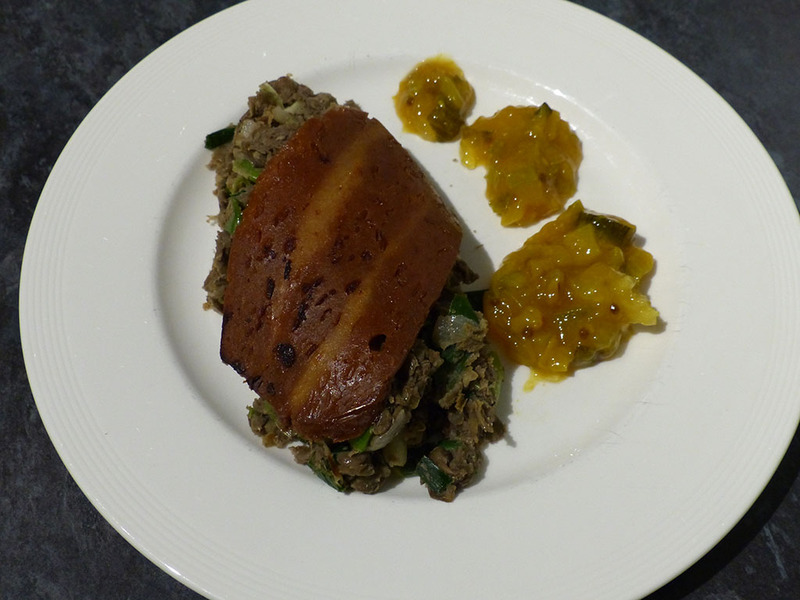 Add the lentil mixture to four plates, top with bacon rashers and serve with the piccalilli. Allergy advice: Although all other ingredients in this recipe are gluten free, most shop bought piccalillies contain gluten, there are gluten free piccalillies out there, but you have to look. Or you can also make your own without the use of gluten containing ingredients!